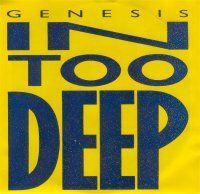 Even if you are a collector of 45 rpm singles of pop songs from former progressive rock bands, In Too Deep is simply a terrible pop ballad undeserving of even making a collection of outtakes. It reminds me of elevators, supermarkets, physician's offices, car rental offices, and two-floor American suburban malls; basically the kinds of places that think this would make soothing background music. Yawning is typically the main cause of listening to this. On the US release B side is the song I'd Rather Be You. This song is basically a fast-paced, bouncy pop song. It would fit nicely on Phil's No Jacket Required solo album. This song found its way onto the Archive 2 box set. So both sides of this single are quite awful. If it could receive less than one star, it certainly deserves it.